Why should people spend money on this and it can't even tell you what your location is to figure out what precinct you're in? Update this already because if you did then it would be amazing. Just went to 1 star because there is no update for PBSI with the opening of the 121 precinct. It would be nice if the sectors were included on map. No issues with freezing but controls are not too user friendly. Station house locations wouldn't be a bad idea also. You should get a lot more for $8. 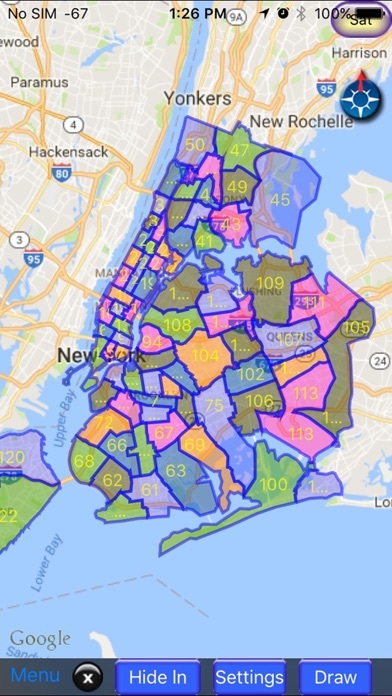 Please add 121 Precinct / update 122 Precinct boundaries soon. Wow what a waste of $ this app is horrible never loads any roads is extremely slow! Please don't waste you money like I did! Doesn't show the station house or any details! It may be slow for iPhone 3G, but definitely not for 4 or 4S!, if it crashes, it means memory is not enough, you have to close all other apps running in background and retry it. Would be great if it wasn't so horrible. Crappy interface!! Crashes constantly !! Slow !!!! 1 star for the idea. Fix this so it can be as useful as it should be !!!! I wish it did what is says, but instead all it does is crash. This app has great potential but is slow and glitchy. I do use it once in a while, and am hoping the developer will work out the problems. Also sector support would be helpful. The controls are a bit confusing and it's missing sectors but overall, a GREAT app for patrol and anyone else who is curious about their resident percent or someone else's - keep up the good work. Please just add a 'locate me' button!